Sean Russell Dawkins was born February 3, 1971 in Red Bank. Sean’s mother, to whom he was particularly close, drove him across country to start a new life when he was a boy. They settled in Sunnyvale in California’s Silicon Valley. Tall, fast and athletic, Sean blossomed into a football star at Homestead High in Cupertino. He was widely recruited as a wide receiver but decided to stay close to home and signed with the University of California, less than 90 minutes away. Sean developed a great rhythm with quarterback Mike Pawlawski. In 1990, he caught 215 passes and scored 5 touchdowns and helped Cal reach its first bowl game since 1938. The Bears beat Wyoming in the Copper Bowl. In 1991, Sean had another great year with 40 catches and 11 touchdowns catches, as Cal achieved a Top 10 ranking after upending Clemson 37–13 in the Citrus Bowl. After back-to-back bowl wins, coach Bruce Snyder left the school and was replaced by Keith Gilbertson. The Bears’ record dropped to 4–7 but Sean had another excellent season, leading the NCAA with 65 receptions and 14 TD catches, earning first-team All-America recognition. He decided to skip his senior year and declare for the NFL Draft. The Indianapolis Colts selected Sean with the 16th pick in the first round of the 1993 draft. He won a starting job midway through the season and finished with 26 catches. 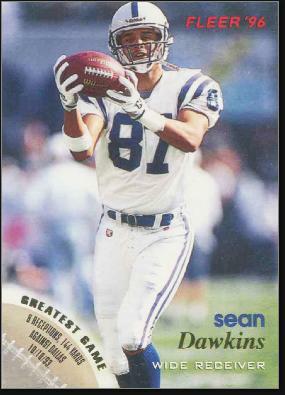 Sean was the starting wideout for the Colts in each of the next four seasons. He caught 225 passes over that span and scored 11 touchdowns. The Colts came within a Hail Mary of winning the 1995 AFC championship. When the Colts drafted Marvin Harrison, Sean became expendable. They offered less than Sean expected in a new contract and he opted to go the free agent route. Given that Indianapolis drafted Peyton Manning that spring, Sean might have been better off finishing his career with the Colts. Sean played one season for the New Orleans Saints and then signed another free agent deal in 1999 to plat for the Seahawks. Sean’s mother was battling cancer—a fight she would lose that year—in order to be closer to northern California. Despite the personal tragedy, he enjoyed his best season as a pro, with 58 catches for 992 yards and 7 touchdowns. Sean had another productive year for the Seahawks in 2000 and then played one final season as a reserve for the Jacksonville Jaguars. He tried to hang on with the Vikings for one more season but didn’t make the final training camp cut. Sean became a real estate investor after his playing days and then got into law enforcement. In 2005, he was inducted into the University of California Athletic Hall of Fame.